Although I am not native to this place, it's the first place in a long time where I have truly felt at home. I grew up on The Other Side of the River, in southwest Ohio... another area formed and informed by water. Anyone who knows me knows I've been something of a rock and fossil for many, many years. It's also not a far stretch for anyone who knows me or has read anything I've written over the past 3 years that I am far more interested in the geographic map than I am the one carved by the violent hand of Manifest Destiny. 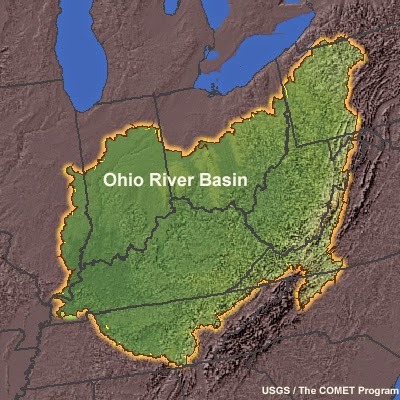 The image above shows the Ohio River Basin -- the land informed and formed by the Ohio River and all of it's tributaries. These are the only sort of map lines that matter to me : rivers, mountains, plains. All formed by water or the absence of water. All of it more ancient than we are or than we will ever be. All of it the cradle of my birth, my axis mundi, and my deathbed. For as much as I have wandered and will continue to wander, this land of the rivers, hills, and mountains is where I am most at center. Because people first traversed the Ohio River, the rest of the country was drawn on a map. Before there were roads, there was the river. Money has been made, blood has been spilled, all in the name of controlling the waters that have forged this land mass, grew and encouraged culture, and erased it when the river runs too high and people forget the sheer power embodied in the these, the most sacred of terrestrial veins. Now the Ohio River, giver and taker and destroyer of life, is also the dirtiest river in the country. The reasons are not difficult to fathom. Industrial waste and chemical spills are large and easy culprits to target. Of course, The Courier-Journal, a wholly owned mouth piece for conservative media giant Gannett with headquarters in the conservative southern state of Virginia, points out that the unusually high -- though perfectly safe for humans -- nitrate levels are also due to farm fertilizer run off. That's right, Dear Readers. Old McDonald is trying to kill you. The other culprit they mention by name is AK Steel in Indiana -- which is historically pro-union and therefore not on the Good Boys and Girls list maintained by Gannett and other media puss monsters like Clear Channel Communications... not to mention the NSA and the FBI. January 2014 -- The Elk River Spill -- Freedom Industries** spills several 10,000 gallons of chemicals that eventually made its way into the Ohio, and hence into the Mississippi. January 2015 -- a "chemical sheen" resulting from a leak in a Rubbertown plant owned by Valero, an oil company. April 2015 -- Sewage leak in Louisville releases 100 Million gallons of untreated black (sewage) water into the river. And if you think it's been a bad year or two, here a link to an article from 2007 about a barge spill. The all to quick dismissal of any potential harm the current state of the river might cause to human or non-human life only demonstrates just how short-sighted and greedy we have become. The only projections are on corporate profits and not on the direct or indirect impact to the water table, to water shed areas, and other bio-diverse environments. Now, to the truly disgusting work of cleaning it up. But if we don't, who will? *Long before the locks, the Falls of the Ohio were actual falls. They weren't dangerous -- mostly -- but they did force people traveling south on the river to walk the boats through the choppy water. This led to camping and trading along the banks, which eventually led to settlement and eventually to Louisville. ** Here's a link to a National Geographic article about a century's worth of system greed and laziness that precipitated the Elk River spill. The lesson is this -- these things don't just happen. They are the result of sheer stupidity over a long period of time. Each new sunrise brings with it another necessary reckoning. are heard among the screams and symphonies of sprouting spring leaves. The suburbs are not safe anymore. Spring rains embolden normally manicured and cultured grass. Rebellion breaks out in the form of crab grass and dandelions. No amount of chemical lawn treatments will make the weeds spill their knowledge.